Getting to the bottom of some tricky dog behaviors. Training, consistency and expertise are key to resolving challenging dog behavior. We've included a few common behavior challenges here to give you tips on how to train your dog, but we always recommend consulting with a behaviorist or training professional. Attention seeking behavior may be either active or passive, and the attention it elicits may be negative or positive. To prevent this behavior from developing, always ask your dog to do something (sit, stay, come) before getting anything (food, walks, attention, petting, toys). Ignore attempts to get your attention through undesirable behavior. For example, if your dog jumps on you to get your attention, instead of pushing the dog down, shrug the dog off and walk away. Do not give your dog any attention until he has exhibited a desirable behavior, such as sitting on command. The goal is to teach your dog acceptable forms of attention-getting. In order to succeed, you will need to praise and reward the dog when he is calm and relaxed. 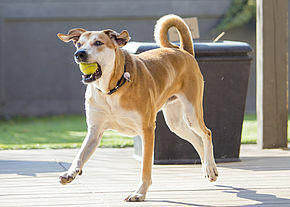 Many dogs with barking “problems” are merely exhibiting normal canine behavior in response to environmental stimuli (sights, sounds and scents). Some breed types, including terriers and scent hounds, have been bred to bark more than others. Because barking is a self-reinforcing behavior, it is important to teach your dog what type of barking you find acceptable right from the start. Determine why your dog barks. Stopping it may be as simple as eliminating the source. For example, if your dog barks out the window at other dogs, you might try leaving the curtains closed and using music to mask outside sounds. Teach him a more acceptable replacement behavior, such as sitting on command. Immediately redirect him to another activity. As soon as your dog engages in the acceptable activity, praise and reward him. Avoid giving him any direct attention (including verbal or physical corrections) while he is barking. Some dogs regard even negative attention such as being scolded as desirable. While teaching acceptable barking behaviors and training are the best paths to long-term success, in an urban living environment, barking can lead to issues with neighbors and escalate to ultimately requiring owners to find a new home for their best friend. If you need a humane way to control your dog’s barking when you are away, consider a citronella anti-bark collar, which emits a citrus oil mist in response to the dog’s bark that discourages him from barking without causing fear or pain. While you still need to address the cause of your dog’s barking, citronella collars can help prevent excessive barking. Ultrasonic anti-bark collars are not effective on most dogs. The stimulus of barking is more rewarding than the deterrent. “Shock” or “electronic impulse” collars work by causing pain, which can heighten anxiety. They are not recommended. Many dogs dig out of boredom, so digging can be curtailed by constant supervision and plenty of exercise. Some breeds are bred to dig, so redirection to an allowed digging area should be considered. Never directly punish your dog for digging. Remember, for many breeds, this is a natural activity. If you catch your dog in the middle of digging, interrupt him with an indirect stimulus and redirect him to acceptable behavior. Praise profusely once he engages in good behavior. Mouthing and chewing are most common in young puppies and dogs new to the household, especially in play and while teething. It’s up to you to teach your dog what is acceptable and what is not. The surest way to encourage mouthing and biting is to get down on all fours and act like a dog, growling and wrestling. If you do not want your puppy to treat your children or visitors like dogs it is important not to act like a puppy. If you encourage rough play one minute and get angry the next, your puppy will be understandably confused—and angry. Dogs must learn to inhibit their bite - to be careful with the amount of pressure they use - before they are four months old. Normally, they would learn this from their mother, their littermates and other members of the pack. But when puppies are taken away from this environment before the learning is complete, we must take over. If your dog or puppy mouths your hand, make a quick, high-pitched yipping noise to simulate what your dog’s littermate would do. Discontinue playing and leave the room; do not look or give any attention to your dog. Eventually, he will learn that the mouthing behavior makes playtime and attention come to a quick stop. Discourage chewing by dog-proofing your home. Ensure nothing valuable or dangerous is accessible to your dog. Provide constant supervision so you can teach him what is acceptable for him to chew on. Do not allow your dog to wander the house unsupervised. Once he has learned what not to chew in one room, introduce him to another room. Avoid allowing full run of the home until you are sure that it is safe to do so. Most puppies aren’t ready until approximately one year of age. There are several safe anti-mouthing and anti-chewing products to consider, including apple cider vinegar, mouthwash and Bitter Apple spray. Put it on anything you do not want your dog to mouth or chew on. The bottom line: Dogs need rules that are fair and firmly enforced. Your pup will feel safer, more secure and less stressed when he knows that you are in charge. Destruction can include normal chewing and teething or play behavior. You can help prevent it by limiting access to vulnerable items, redirecting chewing to appropriate toys, increasing exercise and providing stimulating playthings. If your dog begins to display destructive behavior, avoid directly punishing him. Instead, interrupt him with an indirect stimulus and redirect him to acceptable behavior. Praise him once he engages in good behavior. Jumping is a habit that is important to break early on. Your dog should learn as soon as possible that jumping is not an appropriate way to greet people. If your dog jumps on you or others, do not give him any attention (positive or negative). Instead, turn your back to him. Turn around only if your dog sits or stands nicely. He will realize that in order to get attention, he needs to sit or stand nicely. Encourage family and friends to follow this rule with your dog. If jumping is a continued challenge, consider placing your dog on a leash when you have visitors. Mouthing, jumping, mounting and rough play should be discouraged from the first day you bring your new dog home. Remember that what is cute and playful in a puppy can be annoying and dangerous in an adult dog. Teach your dog to only play with toys (not hands, feet and other body parts). Ignore all inappropriate playing and avoid rough play. Teach your dog rules for play (drop, stop, etc.) and consistently and positively reinforce them. Aggression is a very serious and surprisingly common behavior challenge. In fact, all species of animals use aggression to defend themselves from perceived threats or to compete for resources such as food, mates and sleeping locations. There are a variety of ways dogs show aggression. As soon as these behaviors appear, we recommend that you contact a trainer or behaviorist as soon as possible to prevent further escalation and to assist you with addressing identified issues. Many dogs are naturally reluctant to having their bodies touched or manipulated in certain places or ways. If they are not taught to accept and enjoy handling, they may threaten or bite in this context. 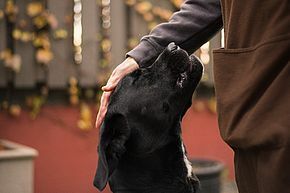 Gradual exercises can desensitize dogs to being patted, hugged and grabbed by their collars and to tolerate having their feet, mouths, tails and bodies handled or restrained. Fights between dogs who live together are common. Dogs compete for resources such as food, bones, toys, owner attention and sleeping spots and have individual preferences and moods. Once the triggers are identified and removed or adjusted, fighting can be reduced or eliminated. 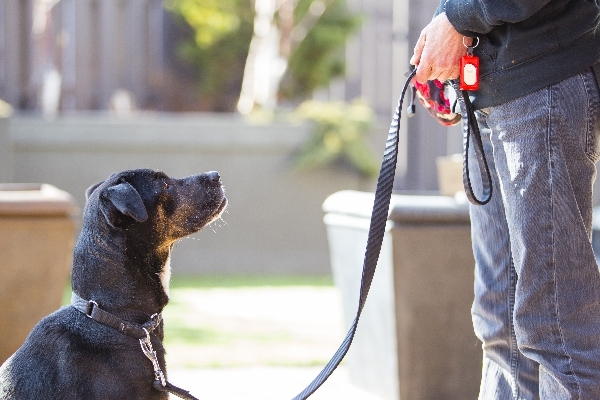 Create an obedience routine to manage the dogs. This may include reinforcing good behavior, adjusting emotional associations or giving time-outs. If fights become injurious to the dogs or people in the home, consider contacting a trainer for support. Socialize your dog to as many people and friendly dogs as possible. Make it fun with lots of treats and playing. Practice anti-guarding exercises. Teach dogs to bite softly by using timeouts for hard bites before forbidding all play biting. Handle your dog all over and make it fun with treats and praise. Find and enroll in a training class that covers these exercises and allows free play. Maintain socialization and comfort around resources and handling with regular practice. Maintain your dog’s soft mouth by insisting he take treats gently and by carefully monitored and controlled physical games, such as tug. If prevention is not working and you are concerned about your dog’s aggression, contact a trainer for support. Dogs are pack animals and prefer to be with others. When left alone, some dogs become very distressed. Dogs who suffer from separation anxiety haven’t learned to cope with being alone. They express their anxiety by barking, sweaty paw pads, howling, whining, chewing, digging, soiling, loss of appetite or attempting to escape. The most effective treatment for a dog with separation anxiety is to get him used to very short periods of time alone. Pair the experience with something positive, such as his favorite treats. It’s best to keep departures and arrivals low-key so your dog doesn’t associate comings and goings with stress. Practice short absences and gradually build up the time you are gone. Finally, give your dog plenty of physical exercise before leaving him for lengthy periods of time, especially if you leave first thing in the morning. Help prepare your dog for different people, animals and experiences. Read more about separation anxiety in dogs.